This meme is hosted by Whoo Gives A Hoot and Foxes and Fairy Tales (which are both excellent blogs to check out) and each week we are given a prompt to write a post about. Today’s prompt is about giving back to authors and we had the choice of picking one author and five favorite books or five authors and one favorite each. I decided to challenge myself and pick just one author and five books from that author. Immediately I knew I had a problem. I could not think of an author I had read five of for the life of me. I know I have read, when I was younger, almost all of Tamora Pierce’s work. Then there are some series, like the Kim Harrison one, where I have read a lot of those. However, my favorite series are mostly trilogies, so I could not even cite those! Finally, I settled (which sounds more negative than it is) on Octavia Butler. She was one of the first authors I read. So I owe a lot of my science fiction obsession to her. Her stories, worlds, and characters can make you uncomfortable, but that, by definition, is science fiction. It is about estrangement. The idea that once we are truly alienated, uncomfortable, then we can begin to look inwards and start to recognize the similarities. 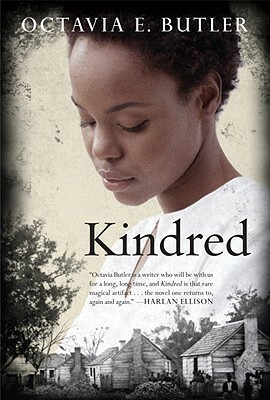 Kindred is a story about a woman who magically is transported back into time. This won’t be one of those Scottish time travel books (you know what I’m talking about here), instead Dana, an African American woman, is transported to the South during the period of slavery. At immense danger, scared and confused, Dana finds out that she has been called back into the past to protect this slave owning boy until he can father her great-grandmother. 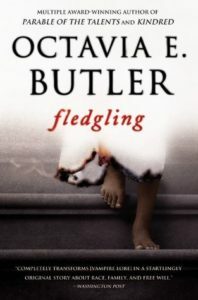 This novel explores issues of slavery, power, and juxtaposes two important time periods in American History. Resisting one definition, this book is fantasy, historical fiction, and a slave memoir. It is an important read that will keep you on the edges of your chair (or sofa, that’s my favorite place to read) till the very end. Butler does it again and brings new life to the vampire stories that are inundating pop culture now. 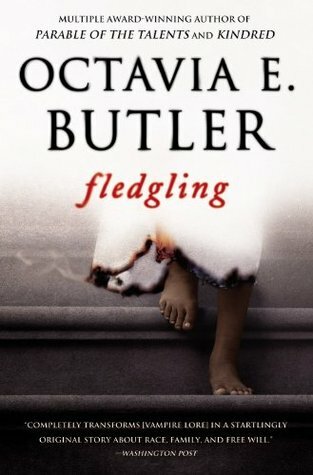 Fledgling tells the story of a girl who has just woken up and has no memory of who she is. That would be difficult enough, but she is also a vampire, does not know where her family is (if they are still around), or why someone is trying to kill her. I think at the heart of Butler’s stories is an awareness of our Otherness. Her stories, whether they be slave memoir, fantasy, or science fiction, explore what this awareness means and what it really means to be human. If you thought she just wrote excellent novels, you would be right, but also pleased to know she published a collection of short stories. I cannot really summarize each one, but just know that the mix is varied, imaginative, and a joy to read. They will make you gasp, make you uncomfortable, and, most importantly, make you think. Having read most of these separately, this collection is truly a gift to have. It is also a great start to your Butler journey because you can see her talent for wonderful world building, ingenious ideas, and compelling characters. My favorites are Bloodchild, the namesake for the collection, and Speech Sounds. In fact I think those are the first pieces of literature that introduced me to Butler. I could not be more thankful. How many times am I going to mention this book and the fact that I loved it so much I wrote a thesis about it until you read this? 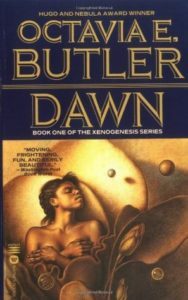 Dawn focuses on the protagonist, Lilith (what a name) who after surviving a nuclear holocaust wakes up one day on an alien spacecraft. Initially shocked, and even disgusted by her saviors (who have captured the humans they could to preserve them) she is told it is time to go back to Earth. Centuries later the survivors are safe and the Earth can support life. It is now her job to create her group of humans, teach them how to survive, and, the hardest part, to coexist with the aliens. It is a mouthful and rightly the entire journey is split into the trilogy. The humans and aliens are practically, if not violent forced, to work together. By getting to know the aliens, the humans are able to begin to get to know themselves. Also I would like to give a shout out for non-humanoid aliens here. I will not spoil you by telling you more about them, but they do not resemble humans. 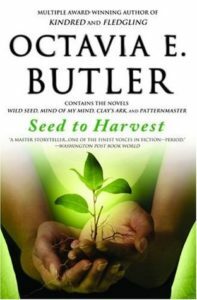 I have included this bonus book, Seed to Harvest, because there are many more books to read from Butler. This is a collection of her Patternmaster books that I own, but have not read yet! But this blog is all about discovery and community, so I wanted to share this book that I am eagerly anticipating. Goodreads says that: In ancient Africa, a female demigod of nurture and fertility mates with a powerful, destructive male entity. Together they birth a race of madmen, visionaries, and psychics who cling to civilization’s margins and back alleys for millenia, coming together in a telepathic Pattern just as Earth is consumed by a cosmic invasion. Now these new beings–no longer mearly human–will battle to rule the transfigured world. Does that not sound interesting? Also if you want more recommendations like this, check out my shelf on shelfjoy. But let’s discuss. What is your favorite science fiction author? If you like this, you may like The Heart Goes Last by Margaret Atwood. Haha! I had the exactly same problem choosing! I couldn’t think of an author with 5 books I’d read that wasn’t all one series. Tamora Pierce would have been one of the few exceptions as well. 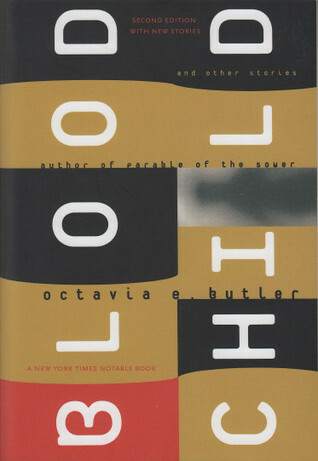 I’ve heard of Octavia Butler a lot, but never read her work, they look really good though. Kindred, especially, I’m definately going to have a look for. YES Kindred is by far the best book to start with. I feel the same way whenever someone asks me who my favorite author is. I mean, I read so much that I don’t necessarily get a chance to pick up everything by a particular author, so how am I supposed to call them my favorite if I only read one series by them or only a couple of books? I actually haven’t read this author before, but I do like the sounds of these. Great post! Yeah it’s hard because they can also write things that we like a lot less. But all the books I mentioned, except Seed to Harvest, I read and really enjoyed 😀 I hope you do too!